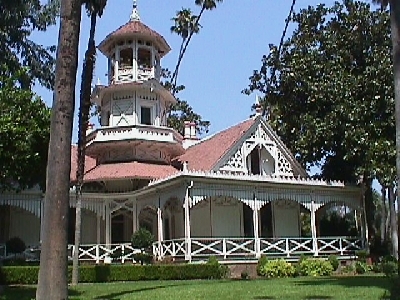 Elias Jackson (“Lucky”) Baldwin’s Queen Anne Cottage was constructed in 1885-86, probably as a honeymoon gift for his fourth wife, sixteen- year-old Lillie Bennett. “For a year after she married Baldwin (May, 1884), this little girl was queen of the ranch,” wrote the Los Angeles Times. Lillie’s father, architect Albert A. Bennett, designed the cottage, but the honeymooners apparently never enjoyed its beauty. Lillie and E.J. separated in 1885, and the fanciful house was converted by its owner into a memorial to the third Mrs. Baldwin, Jennie Dexter, who had died in 1881. A stained glass portrait of Jennie stood welcome in the front door and an almost life-size oil painting of her was hung in the Cottage parlor. Both items remain today. 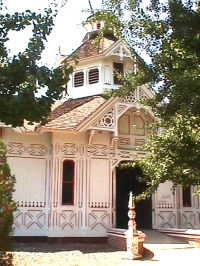 The Baldwin cottage (the designation “Queen Anne” was added in later years in reference to its architectural style) was the Santa Anita Ranch guest house. Cooking and dining facilities and Baldwin’s personal quarters were located in a modernized eight-room version of the old adobe house found on the property at the time of purchase. Friends, relatives and business associates of Lucky Baldwin, including stars from the Baldwin Theater in San Francisco, partook of ranch hospitality until E.J.’s death in 1909. With the settlement of the Baldwin estate, Lucky’s daughter Anita (born in 1876 to Jennie Dexter) closed the Cottage and disposed of all furnishings. Fortunately, Anita removed and stored in the Coach Barn such detachable components as the stained glass windows, black walnut doors, marble fireplace mantels, the hearth tiles, and the encaustic tile mosaic entry floor. All of these items, plus original bathroom fixtures and the exterior marble walkway, were returned to the Cottage during the restoration of 1951-53. Refurnishing continues today with appropriate period pieces. The Queen Anne Cottage is listed on the National Register of Historic Places. A recent comprehensive assessment of the landmark Cottage was completed by Peyton Hall and his team at Historic Resources Group in Pasadena. Formally known as a Historic Structure Report, the assessment followed national preservation guidelines and developed a plan to care for the Cottage. We thank the Dextra Baldwin McGonagle Foundation for its generous support of this study. Dextra Baldwin McGonagle (1901-1967) was the daughter of Anita M. Baldwin and the granddaughter of Elias Jackson “Lucky” Baldwin. Click here to download the report. In the large west room of the Barn note the exposure of a red and white exterior wall, evidence that sometime before the turn of the century, Baldwin enlarged the Coach Barn from its original “t”-shaped construction. Baldwin’s stylish “Tally Ho” carriage, purchased at the Philadelphia Centennial Exposition in 1876, is today on display in the enlarged west room. A wash rack nearby (beneath the wooden farm wagon) was used for washing down the carriages after a dusty drive; pipes below once recycled used water for irrigation purposes. Farm and blacksmith tools on view in the south stall area are representative of those used in the late 1800’s when the Coach Barn was one of many buildings which formed the headquarters of E.J. Baldwin’s 46,000 acre ranch. The Victorian dog house just outside the Coach Barn once sheltered bull mastiffs, Lucky Baldwin’s ranch guard dogs. The Coach Barn is listed on the National Register of Historic Places. Don Perfecto Hugo Reid (1810-1852), a Scottish adventurer and naturalized Mexican citizen, was the first private owner of the 13,319 acre Rancho Santa Anita. 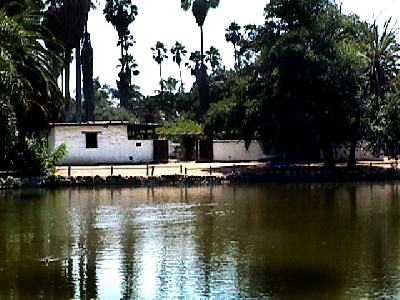 The adobe was constructed in 1840 with the help of Gabrielino laborers. It was built of sun-dried adobe blocks made by mixing clay soil, water and a straw binder. The roof was made of rawhide-lashed carrizo cane (Arundo donax). As protection from the elements, the roof was smeared with brea (tar) and the walls were white-washed. Today’s Reid-Baldwin Adobe, previously known as the Hugo Reid Adobe, is under a major restoration. The structure is designated California Historical Landmark No. 368. Madre newspaper in August, 1890, as “an elaborate two-story depot built with one hundred thousand bricks from the nearby E.J. “Lucky” Baldwin brick yard”, the Santa Anita Depot cost an estimated $5,000 to construct. 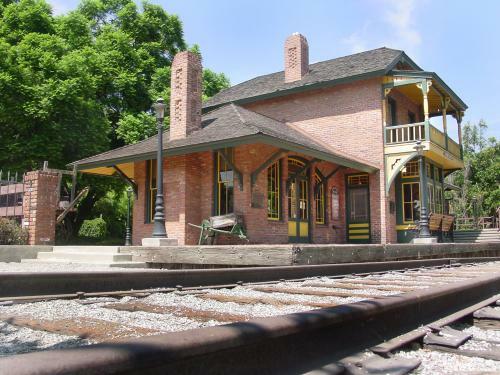 The Depot could not be moved intact, but all the original bricks were removed from the station as well as salvageable doors, trim, beams and even the picturesque Depot balcony. Reference photographs were taken of the interior details, and within days the Santa Anita Depot was a stack of wood and brick in the south parking lot of the Arboretum. Reconstruction was completed in 1970 and fifty yards of Santa Fe standard gauge track was laid in front of the Depot by members of the Monrovia Model Railroad Club. The Santa Anita Depot of today has been refurnished with turn-of-the-century housewares and period railroad equipment to recreate the ambiance of the bustling station stop it once was. Guided tours of the Santa Anita Depot are available on Tuesdays and Wednesdays, 10 a.m. – 4 p.m., and every Sunday 1-4 p.m. (except for Christmas Day) as volunteer time permits. Follow either the dirt path down to the Depot or the winding, paved walkway opposite the Hugo Reid Adobe. Arcadia Historical Museum Early Arcadia memorabilia; photographs, oral histories, newspapers etc.